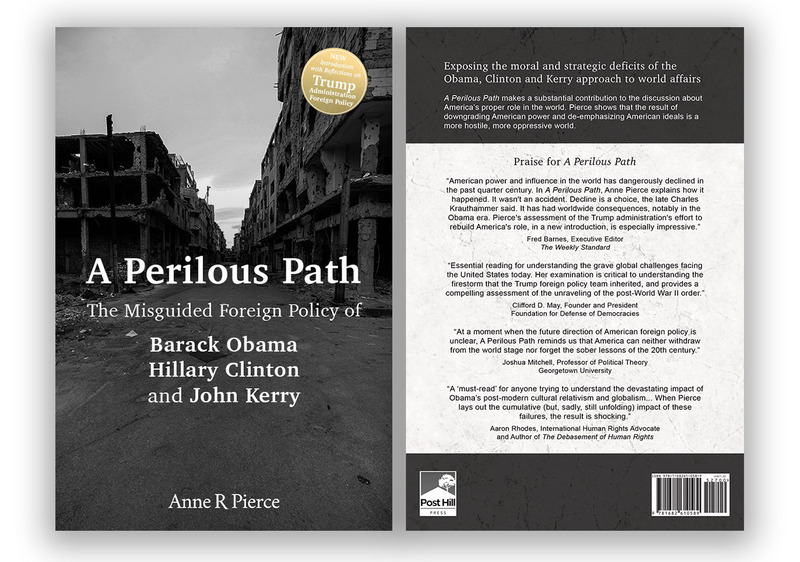 Exposing the moral and strategic deficits of the Obama, Clinton and Kerry approach to world affairs, A Perilous Path takes a close look at American history and the American foreign policy tradition, while at the same time providing a fresh, thought-provoking analysis. Anne R. Pierce tells the fascinating story of Obama administration foreign policy and illustrates its disturbing consequences. She shows that President Obama and his Secretaries of State expended more effort in improving relations with dictatorships than in strengthening ties with democracies or encouraging ideas of freedom. The result of downgrading American power and de-emphasizing American ideals – of forgetting “peace through strength” and human rights – is a more hostile, more oppressive world. With meticulous research, Pierce documents the administration’s decisions and discusses its worldview. The book is now available in paperback with a new introduction on Trump Administration Foreign Policy. A Perilous Path will make a substantial contribution to the discussion about America’s proper role in the world.